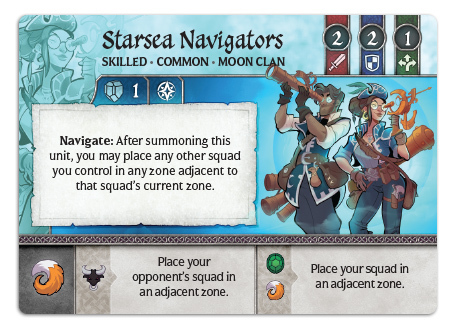 Crystal Clans Preview: No Landlubbers Here! 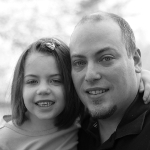 Welcome back to another review of pirates and plundering. Last time we got to meet the pirate crew of the Moon Clan. Today we’ll see that the allegiances they’ve formed go deep. Really deep. Dingy truly is a monster. He has a tremendous attack, but he becomes even more fearsome if he manages to cross the battlefield. 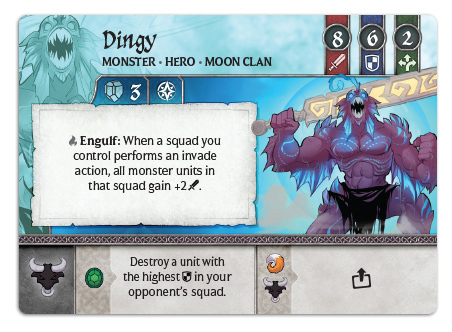 When Dingy is on the battlefield, all monster units gain 2 attack when invading. That’s up to 6 more cards discarded during an invasion. Combined with the Moon Clan’s signature ability to Plunder, the Moon Clan has many ways to force a reshuffle, thus earning them free crystals. In order for Dingy to cross the battlefield, even with Submerge, you’ll likely need a lot of initiative. He’s not exactly the fastest monster. That’s where Starsea Navigators come in. When summoning the Navigators, you can immediately place any other squad you control one space away from their current location. It’s cheap, it’s fast, and you get a unit out of it. Many pirates have come before you, but that doesn’t mean they won’t return. The Sunken Crew can return again and again. 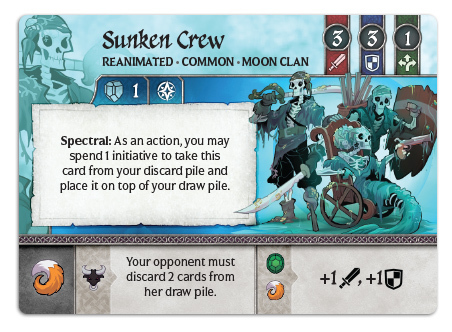 While your opponent is struggling to keep their cards in their deck, you can continually bolster your deck by re-adding the Sunken Crew. And what’s a Sunken Crew without their Ghost Ship? 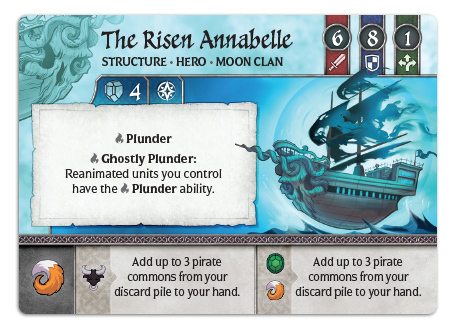 When the Annabelle returns, it is not only the swiftest ship in your fleet, but it also grants Plunder to all of your Sunken Crew. Spooky indeed! Are you excited to try out the Moon Clan!? Are you excited to Plunder your enemies!? Are you excited to make terrible pirate puns while playing Crystal Clans!? I know I am. 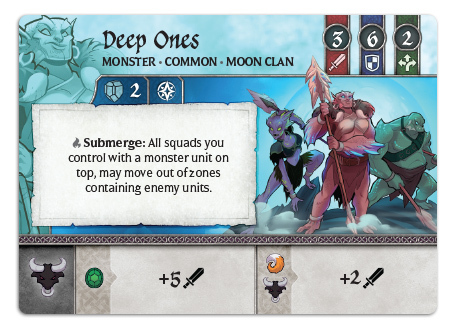 But don’t go running just yet, you’ll certainly want to stick around to meet the rest of the Gem Clan, as we wrap up the first phase of Crystal Clans. Both the Gem and Moon Clan are availabe now from retailers and on our own web-store.